Hey guys and happy Fall home tour day! If you follow me on Instagram, then you know that I have teamed up with a group of seven other FABULOUS bloggers to bring you #FABFALLFEST over the last 4 weeks. 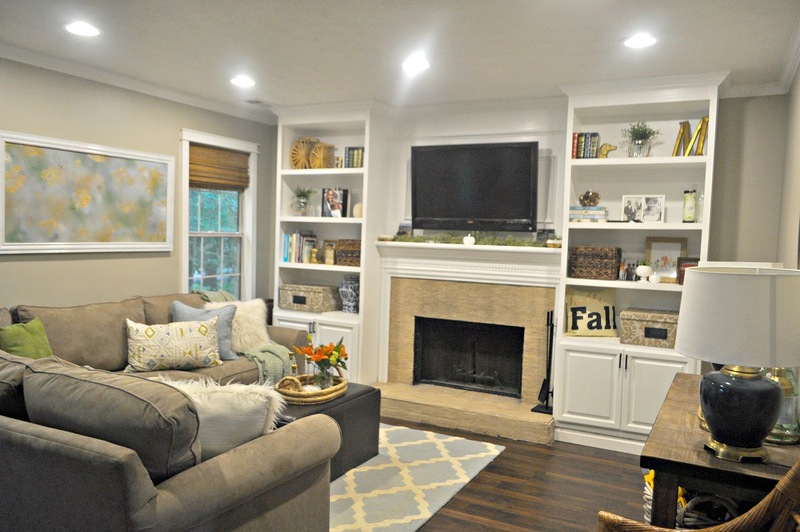 Well, as promised, today we are showcasing our homes for the Fall! To be honest, I am usually a minimalist when it comes to seasonal décor, with the exception of Christmas. 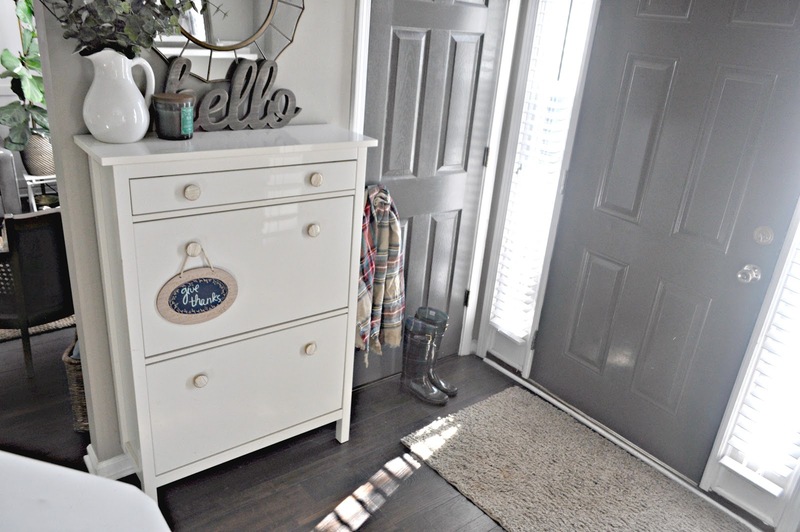 I would attribute it to the fact that I am pretty happy with where my décor stands year ’round, so changing things out seasonally is a bit more work than I like to take on. 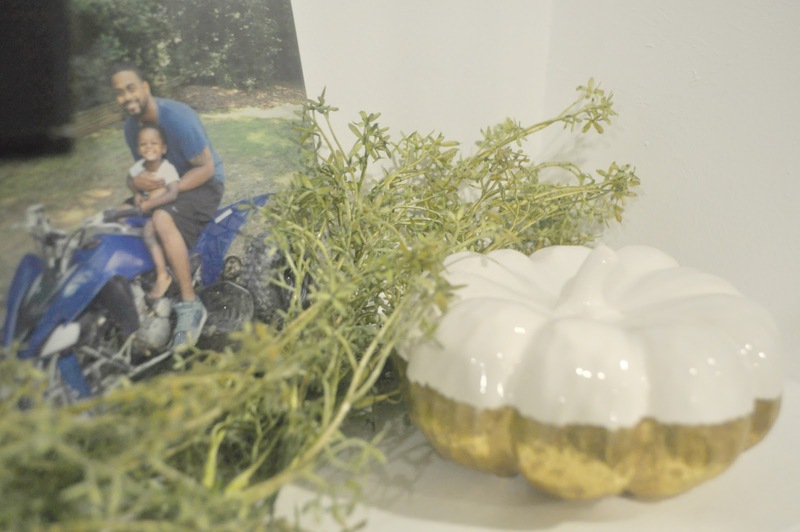 But, since the Fall season is slowly making its way to Georgia (finally), I felt inspired to add a few pops of Fall décor in my home to change the mood up just a bit. 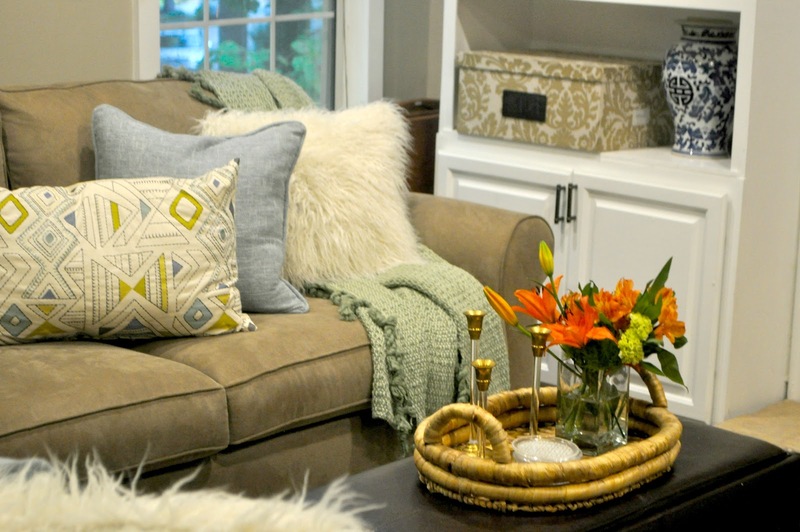 When it comes to decorating for Fall, my style is fairly simple and neutral. 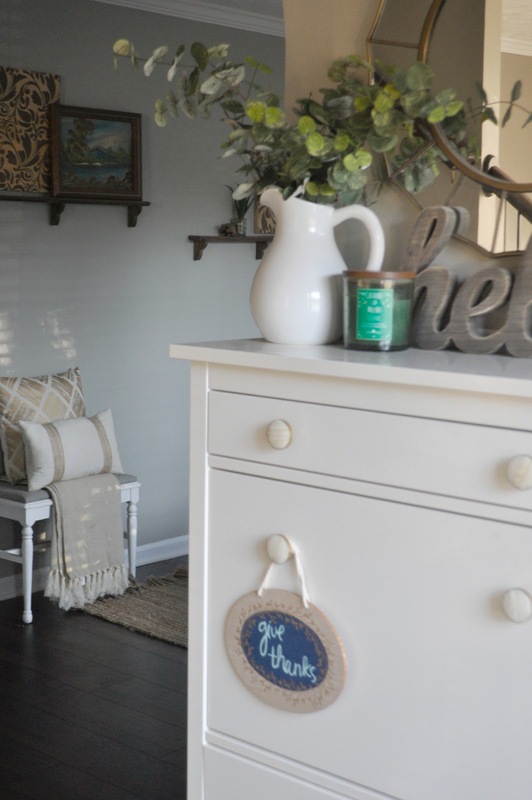 Traditional Fall colors get replaced with my personal rendition of Fall colors, such as blue, white, gold, natural, and wood-tone accents, along with Fall scented candles. 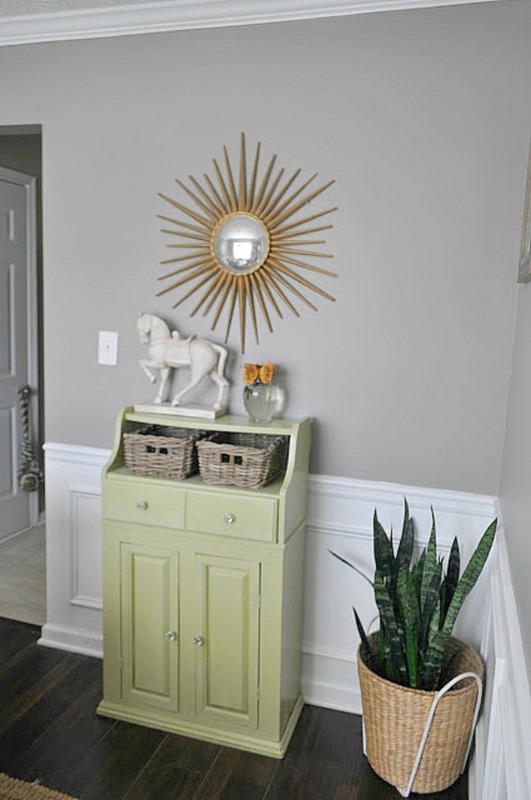 I’d like to think of my Foyer as functional, pretty and welcoming. 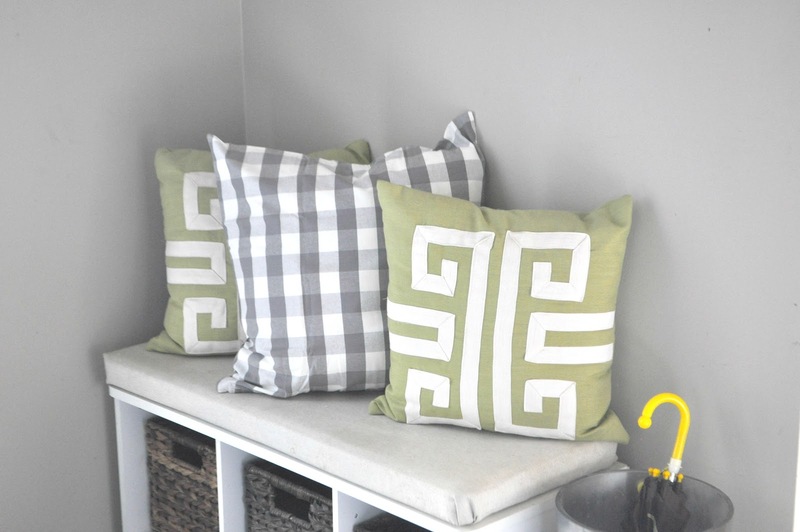 Adding pops of greenery, a cucumber melon scented candle (which smells like heaven), a cute sign, and a quick pillow switch-out to my gray and white buffalo check pillow, my entryway quickly became Fall ready without a bunch of fuss. and seriously…what’s Fall without a little bit of plaid? To the left of my entry is my dining room. 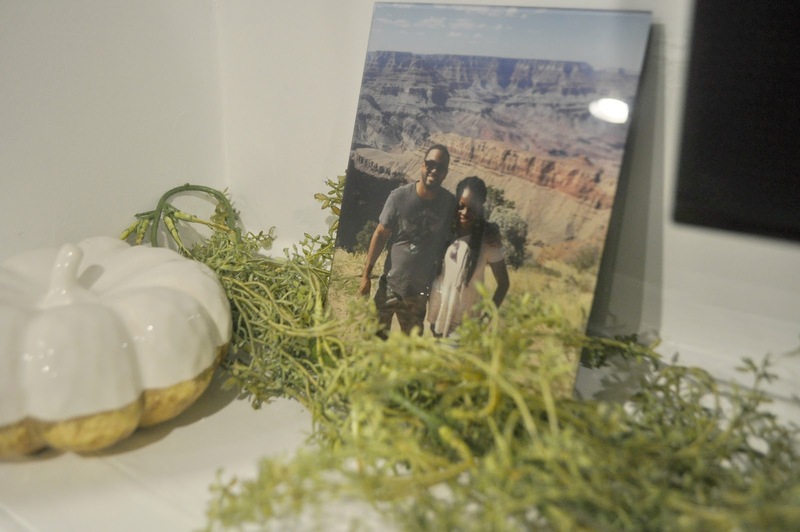 I kept it pretty simple in here adding a dough bowl green garland , and fabric and glass pumpkins . 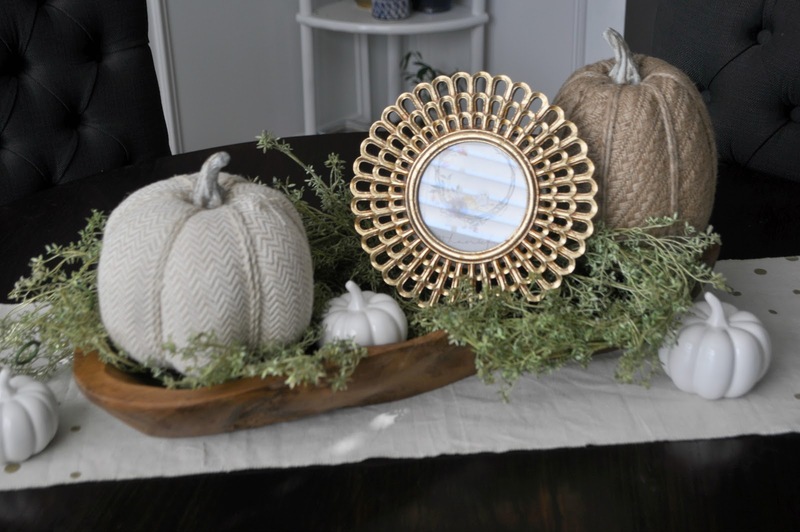 One of my favorite additions to my Fall table décor is this gold round picture frame that I purchased from At Home. 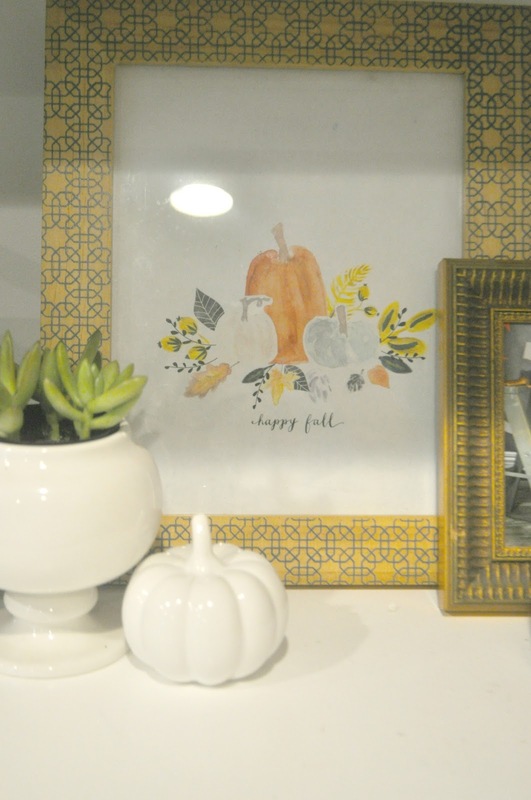 The printable inside of this frame which says “Thankful” can be found here. 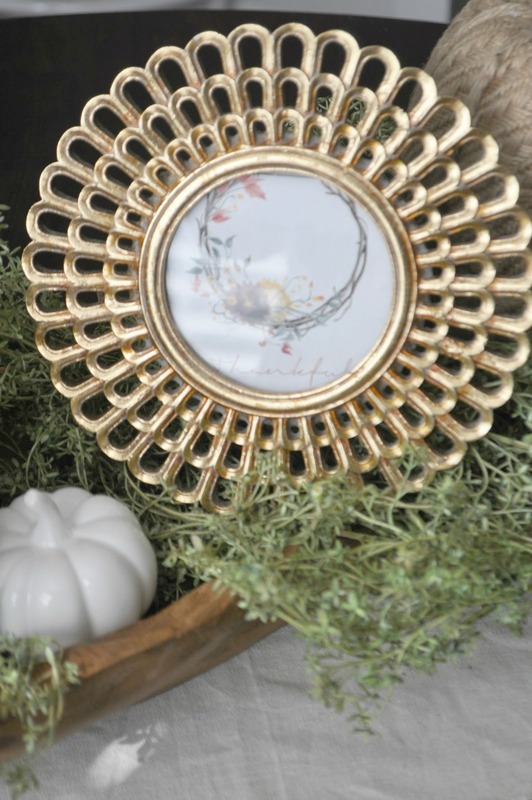 I love how the frame adds the perfect glitz to an otherwise simple table centerpiece. 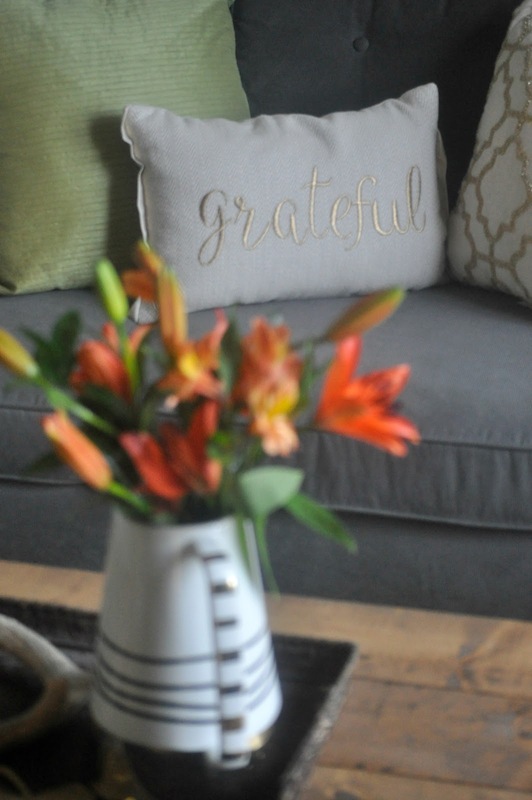 In the living room, I only switched up a couple pillows and added a discounted Fall floral arrangement from my local grocery store. I love adding this fur rug to the bottom of the table every year as well. 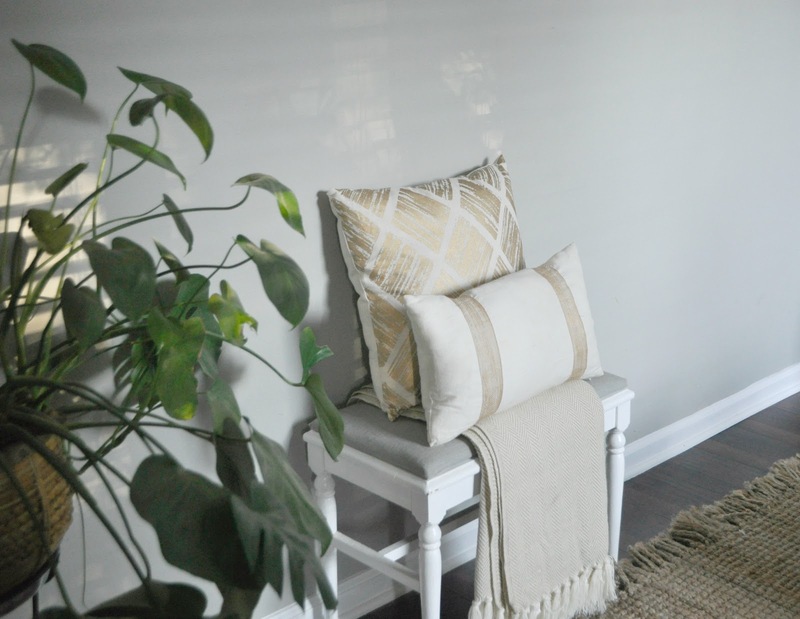 This gold and cream pillow is from At Home and I love the change is mood it adds to this room, from the past colorful one that occupied this space. 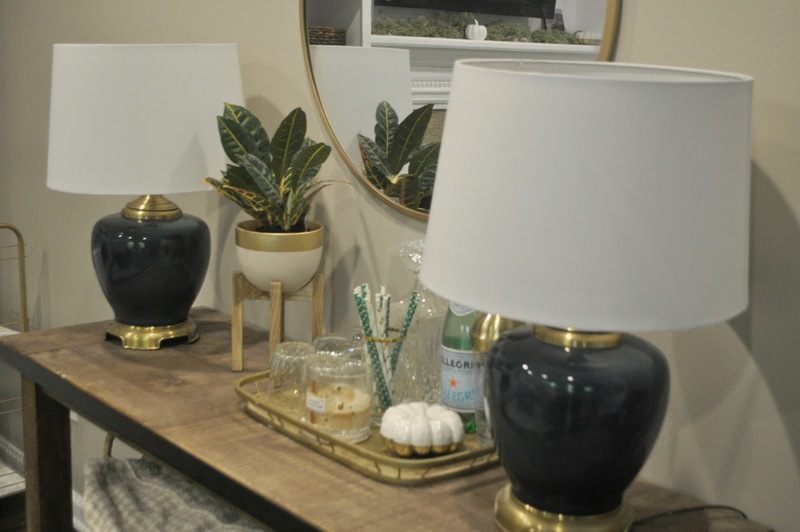 My goal in the family room was to change things up a bit for Fall by adding texture and pattern, but you know I had to stay true to the colors I love, which as you know are blue and green. It’s kinda hard to make that look traditionally Fall like, but adding in different elements helps out a lot. 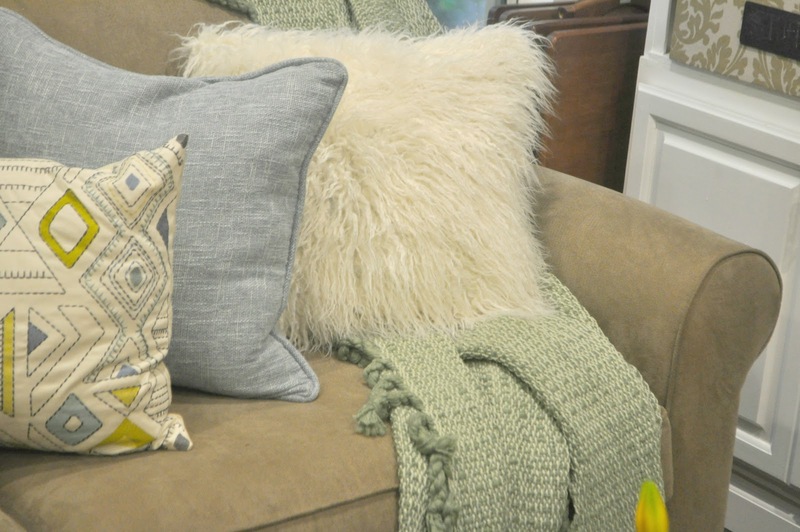 I love adding pattern in through throws, and different pillows. The patterned pillow and furry one are both from At Home. I love the coziness it adds to the room. 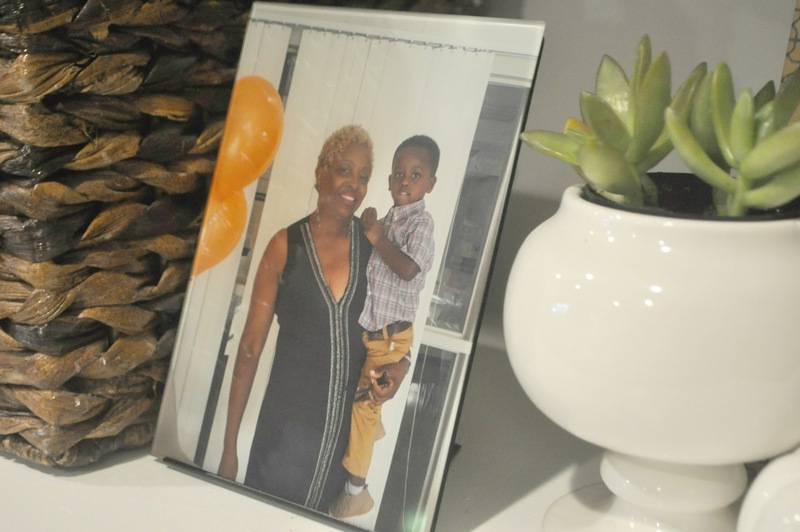 Printables are such a easy and cute way to add free decor. This one can be found here. 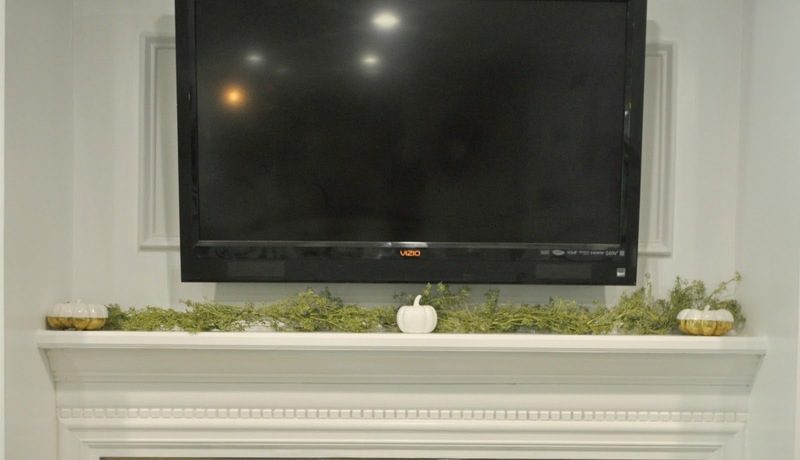 I kept the mantle simple with greenery. But I still felt like it was missing something. One of my most favorite additions are my glass photos from Fracture. I uploaded the photos to their site, and they are printed directly on to glass and shipped straight to my door. I love them on the mantle among the greenery. 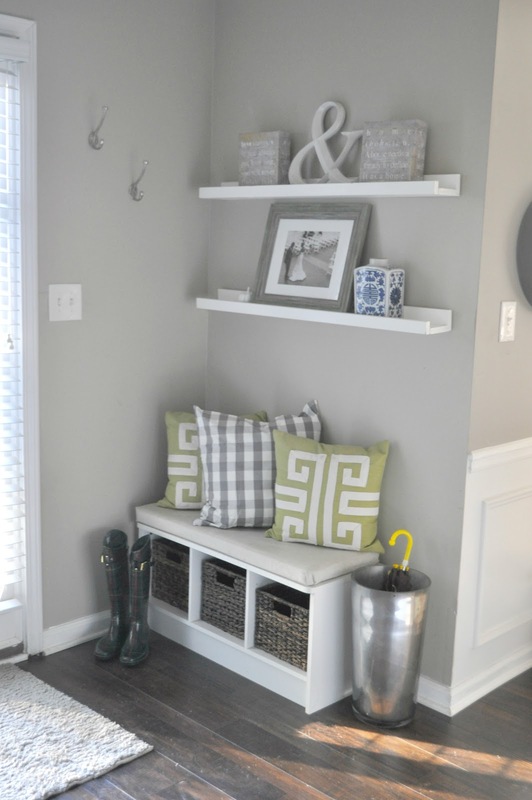 What changes are you making around your home for the Fall, if any? I want to thank At Home and Fracture for sponsoring this post. All opinions are my own. Wow Erin! I loooooove your dining room centerpiece! ….can you come make me one! 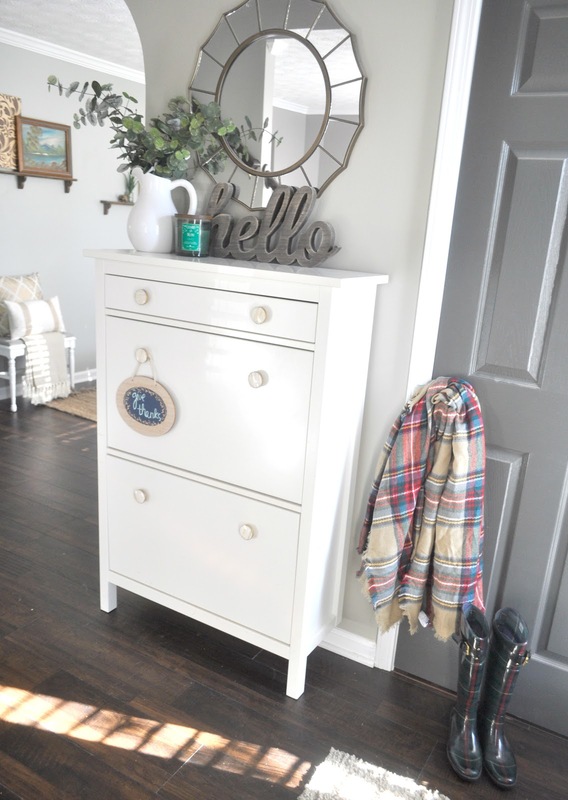 You have some really great At Home Finds! I love all the little Fall touches you have made, looks great! thank you so much Alaya! Of course I can make you one. It was actually really simple, surprisingly. Erin, your home looks amazing!!! 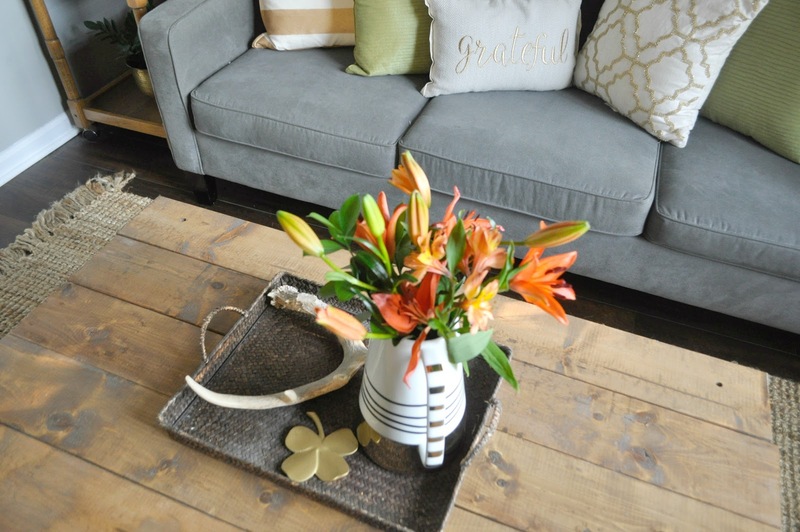 I am loving all of the pops of orange with your green decor, so so pretty! 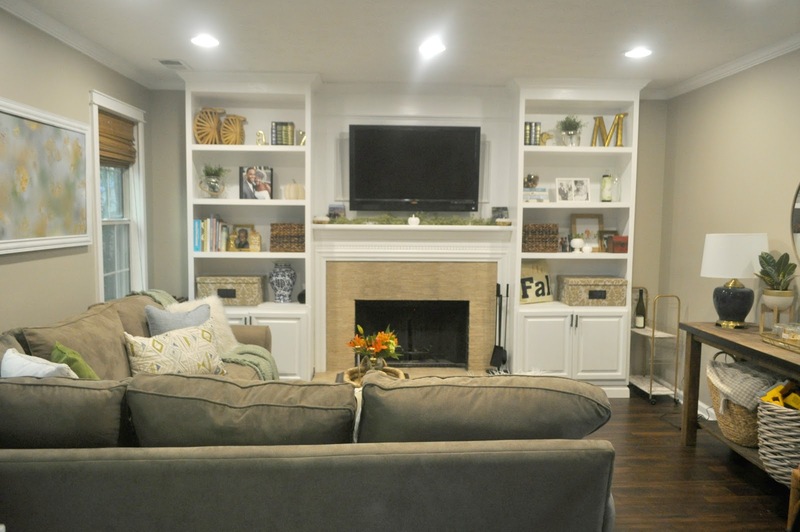 Your built-ins are perfectly styled and your sofa looks so cozy with your new pillows and throw! heart eyes, heart eyes, hear eyes, lol! You did your thing girl, love it all! Thank you Carli! Your comments are so nice and I appreciate you checking out my post! I hope you had a great weekend. Erin, your home looks fantastic. I love all the fall touches you add. But most of all I love the simplicity of it all. Thanks so much Lauren. I am glad you appreciate the simple decor! Erin, your home is so inviting! I especially love your dough bowl centerpiece! 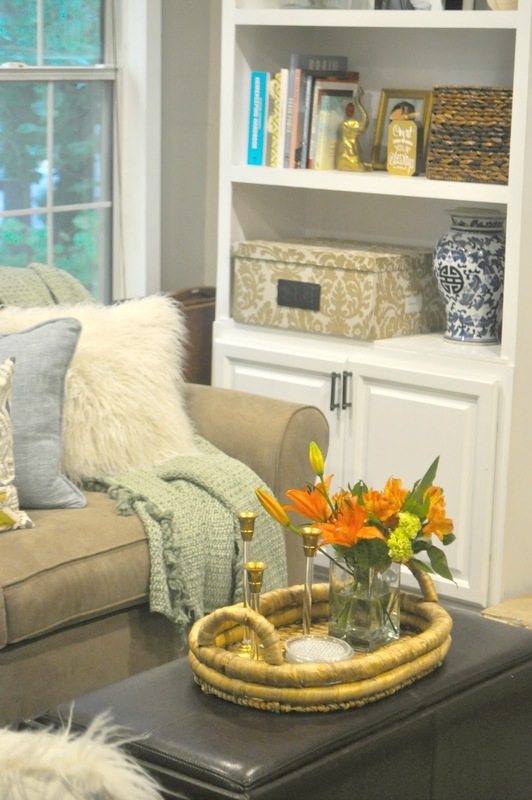 I love how to portrayed fall in your home, so cozy. This is so pretty Erin! I love your table decor and the fur throw pillows! Thanks Liah! I was shocked my husband liked the fur throw pillows as well. Thanks for stopping by. 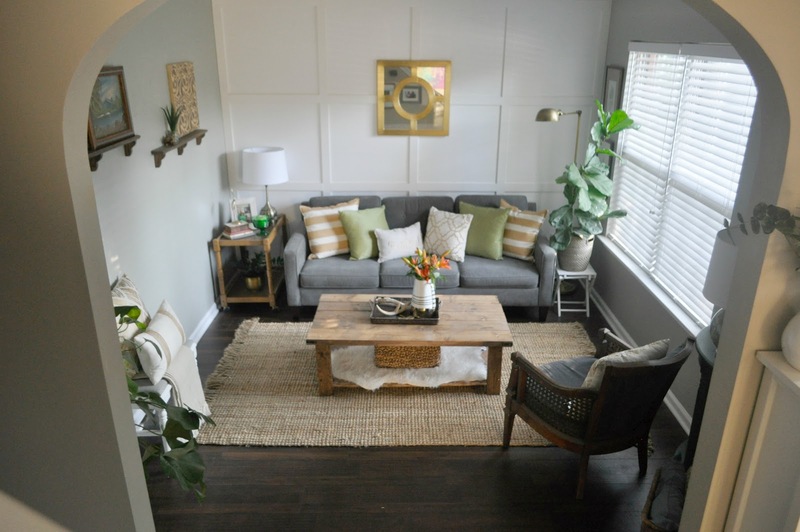 Erin, your family room is sooo pretty! Love those sweet family photos you have throughout! The centerpiece in the dining room is lovely as well! Love the whole tour! Thanks Linda! I appreciate you popping by. 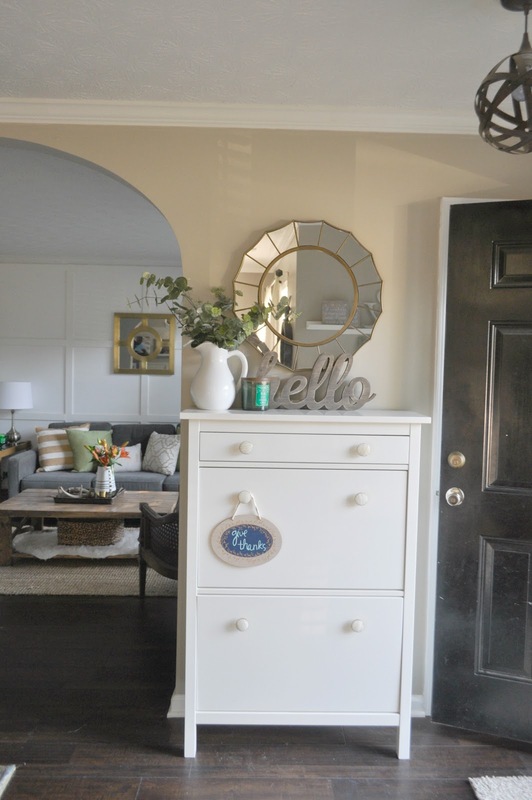 Beautiful home tour, I love so much of what I've seen!! Very warm and inviting with family photos, love the printables, those brass and glass candle sticks 😍 !! Great tour, I enjoyed it!! Thank you so much! The brass and glass candle sticks are from Goodwill. I seem to have the best of luck with finding awesome candlesticks at Goodwill. Thanks for stopping by. Beautiful. I'm not a one to change my decor with the season either but I have added a few pumpkins here and there. Thanks Andrea. Glad I am not alone with like to keep the same decor. Thanks for stopping by. 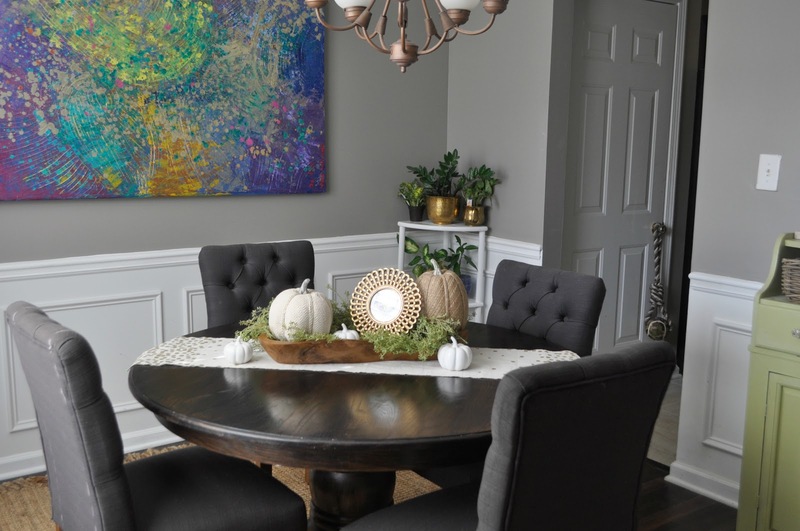 The dining room chairs and those chunky navy lamps are both my faves. Thanks for inviting us in. Thanks Tiffany. The lamps were a Goodwill find! It's all so beautiful, Erin! I love how you brought in all the green, especially the foliage! Erin I love everything ! Your built ins though are simply gorgeous ! I love the way you style them !